Birdies Before the Birds for Monday Night Football!! Who says you can only play golf in daylight! 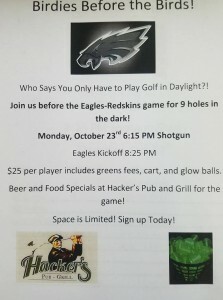 For the first time in many, many years, Middletown Country Club is hosting a 9-hole Glow-Ball Golf Night in conjunction with the Monday Night Football Eagles vs. Redskins NFC East Matchup on Monday, October 23rd. Golf will begin with a 6:15 PM shotgun start just as sunset is occurring. The 9 holes that will be played in a shotgun start format will be 1-4, 8, and 15-18. Hacker’s Pub and Grill will be open for the game and will be offering food and beer specials as we cheer on the Birds to victory!